Bar Keepers Friend (now re-branded as Brite Power Powder) is the best product i've found for removing smears/grease/film from windscreens. It's cheap, easy to use, and leaves a perfect smear free finish. Curious? Well then read on to find out more. 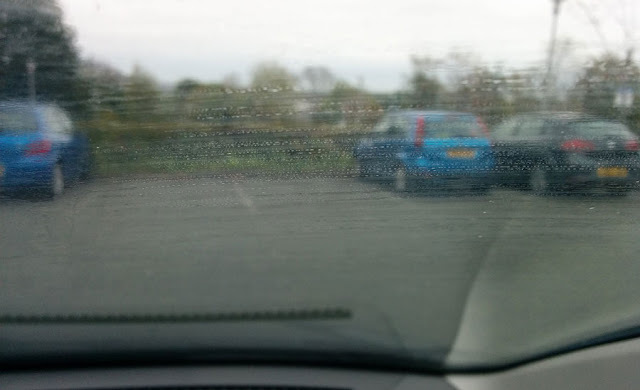 Windscreen smears are caused by all the general c**p that lands on your windscreen: dirt, grime, grease, car shampoo with wax, old/poorly applied windscreen sealants, tar, oil, diesel fumes etc. The list goes on. If it's not properly cleaned, this layer of greasy contaminants will build up over years and becomes more and more difficult to remove. Often, this layer cannot be removed with standard glass cleaning products, no mater how hard you scrub, they just don't have the strength to cut through the baked on layer of grease and grime. I even tried using a clay bar but this made little impact. I turned to Google and found a LOT of people seemed to be raving about Bar Keepers Friend for cleaning windscreens and other glass. A quick trip to the local discount store and a couple of quid later I was ready to go. The active ingredient in Bar Keepers Friend/Brite Power Powder is oxalic acid, which is found in spinach, rhubarb and other green vegetables. When working the powder into the windscreen you can feel it biting, it feels like an abrasive. Work the powder into the windscreen in circular motions, with reasonable pressure until the powder has dissolved. Thoroughly rinse the windscreen with water and a sponge to remove any remnants of the powder. You may also want to rinse the surrounding paint work to ensure non of the diluted powder is left to dry. In a little over 5 minutes later my windscreen was like new. I also gave the wiper blades a clean/degrease with a microfibre cloth and traditional glass cleaner. At the weekend I think i'll buy some new ones anyway as the passenger side is an inch longer than it should be. Bar Keepers Friend is the original branding, and there are many threads (like this one, and this one) on the internet raving about how great it is at cleaning windscreens. However, Bar Keepers Friend is now sold as Brite Powder Power. Exactly the same formula, made by the same people. Just with a different label on the bottle. I was told this by more than one store assistant when trying to find Bar Keepers Friend. Conveniently, Bar Keepers Friend is also great at cleaning oven glass, stainless steel, porcelain sinks, showers, BBQ grills and loads more around the house. I honestly can't fault this product. It's cheap, easy to use, extremely effective and you can use it elsewhere around the house. This product is reported to be available at many supermarkets and discounters e.g Wilko. However, I just bought mine from Amazon. Have you used this product? Please leave your comments below with your feedback.